While I dance I can not judge, hate, nor separate myself from life. I can only be joyful and whole. This is why I dance. Artists in Motion was started by 4 families all bound by kids that love dance and entertainment and want the skills to help them succeed in their craft. We are a non-profit studio that wants to give back to the kids that wish to excel in dance. Our coaches come to us from all over the world and are very motivated by keeping the dance new and exciting but not forgetting the art of proper training. We offer Masters Classes throughout the season to all Intermediate and Advanced students with a different style every session and at a very minimal cost. We will have classes taught by very well known entertainers, sought after choreographers and incredible coaches. Join us in creating a fun and exciting dance opportunity for all ages. AIM Branson!!! Our coaches love the Art of Dance. They are professional entertainers and choreographers in Branson and around the world. They enjoy teaching all ages of students, bringing joy to everyone through movement and dance. Rest assured your children are in good hands as are coaches understand how to bring out the best of each and every personality, sharing the gift of dance. ** First trial class is FREE for children! Master classes are not included. Sign Up Now for our exciting dance classes! Got Questions? Write to us here! We'd love to be your new dance studio - it's about dancing and the dancer! No drama! 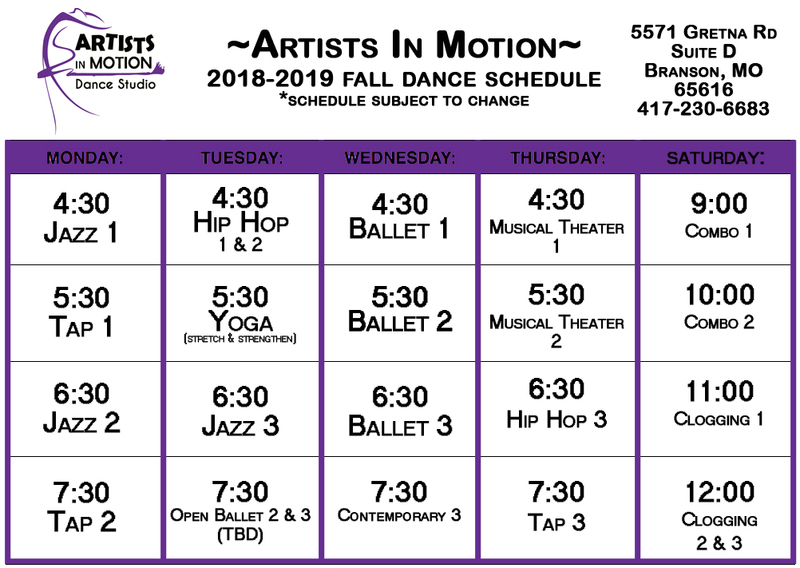 If you would like to register for classes or just stop in to see what Artists in Motion is about, drop us an email. Remember, your first Trial Class is ALWAYS FREE!